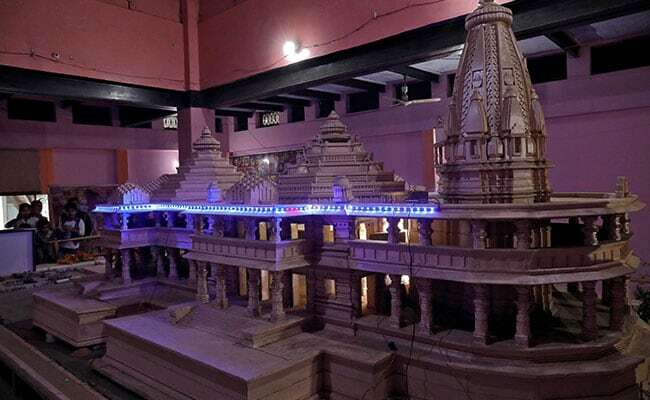 A model of the Ram temple that Hindu groups want to build in Ayodhya. "You will not let this country live in peace... Somebody has to always poke," Chief Justice Ranjan Gogoi told the petitioner Amarnath Misra, a former national general secretary of the Ram Janmabhoomi Mandir Nirman Nyas which wants a Ram Temple constructed in Ayodhya. The Supreme Court refused to overrule the Allahabad High Court which had rejected a similar request to conduct a ceremonial prayer at the "undisputed part of the 67.7 acres land" in Ayodhya and imposed a penalty of Rs 5 lakh. "Mediation will take place. We don't see any legal obstruction to it," Justice Gogoi had said while delivering the order on India's most politically sensitive dispute squarely in the middle of election season. In 2010, the Allahabad High Court allotted two-thirds of the land to Hindus and said they could keep a makeshift temple over the razed mosque's central dome.